﻿ YSoft Solution - About Us - Web & Mobile Software Development Service. 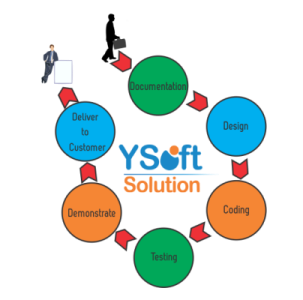 YSoft Solution is a technologies strong outsourcing company delivering critical solution with high-performance and quality software development services. Our focuses on highly qualitative, timely delivered and cost-effective solution. Our Agile Scrum Methodology and Water-fall model adds high performance and quality for your product development and software development. With a rich and varied experience in web and mobile application development and project management capabilities and stringent quality standards ensure us to develop solutions that give your business an edge over your competitors. We are a leading provider of software development, web design & Application development solutions for more than 5 years. We are providing offshore software development services all over the world. Our team of experts have average 5+ years of experience in various technologies. We have young and talented experts who can provide you solution 24 X 7 and also available on your preferred platform either on Skype or WhatsApp or Mobile Or Email. Out team will provide the exact tailor-made software solutions to your business. As an offshore software development company, we place a great deal of importance on achieving our client’s application development goals. Our Agile Scrum Methodology and Water-fall model represents defined set of development techniques established through our years of experience in application life cycle development and management. With this development methodology, we ensure our clients get their required solutions within the stipulated time and budget which can seamlessly align with their IT infrastructure spanning different applications, operating systems and hardware. This is not an end from our side. After delivery to customer, we are also providing support to our customers. To ensure our clients get the benefit of our delivery cycle and development trends, we have combined this project methodology with well-known development approaches which includes Agile, Scrum and Iterative & Incremental model.